Three new aluminum end dump trailers have just been added to inventory at Midco Sales’ dealership in Chandler, AZ. The 2020 Armor Lite SS-85 aluminum end dump trailers measure 39 feet long with 54 inch sides. The smooth-sided sides are constructed from .160 gauge aluminum; and, along with the rounded front nose, provide an aerodynamic design. The rear gates are controlled with manual push/pull switches which are also wired to the front of the trailers. Quicksilver liners have been installed; and electric slide tarp systems provide quick covering of the tubs. 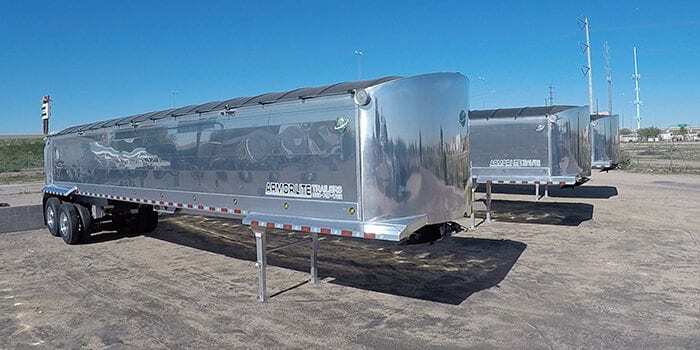 These trailers ride on all aluminum wheels, Dunlop 11R22.5 tires and Ridewell air ride suspension systems. Meritor PSI tire inflation systems constantly monitor tire pressure. The LED lighting systems include extra lights on both sides and rear back-up lights. Midco Sales also stocks Armor Lite half-round steel end dump trailers. Contact the sales office at (480) 999-0607 to learn more about any of the end dump trailers for sale.